It’s morning, I wake up in Vaasa, and I’m supposed to be doing an interview in a couple of hours. First, though, I open my e-mail. There’s a new message: “Could the interview be postponed by a couple of hours? Our matinee was cancelled, I could sleep for a while longer.” Well, that answers the first question in my mind. Samuel Harjanne does sleep – at least sometimes. Striking 12, Helsingin kaupunginteatteri 2011. Åbo Svenska Teater, Helsingin kaupunginteatteri, directing, winning a musical theatre prize… Samuel Harjanne has been busy lately. At the moment, Harjanne, known for his dubbing and musical roles, is performing in Wasa Teater’s Next to Normal. 24-year-old Harjanne has been performing for soon fifteen years. He’s done lots during his career, from a singing competition for children to directing musicals. Before musicals, there was opera. Harjanne’s career started in a children’s choir. Via the choir, he got a part in The Magic Flute and ended up singing in Finland’s National Opera. But getting the part of Gavroche in Helsingin kaupunginteatteri’s 1999 production of Les Misérables was a turning point for him. Next to Normal, Wasa Teater 2012. With Mikaela Tidermark. Harjanne has acted in shows like Helsingin kaupunginteatteri’s High School Musicals and Spring Awakening, not to mention his countless Finnish dubbing roles in animated movies. However, during the last year, Harjanne has acted in two Swedish-speaking musicals. Two of the musicals he’s directed have also been, at least partially, in Swedish. So, it’s surprising to hear Harjanne was not interested in the language at school. Actually, he says he hated it. He’s learned Swedish during the past few years. 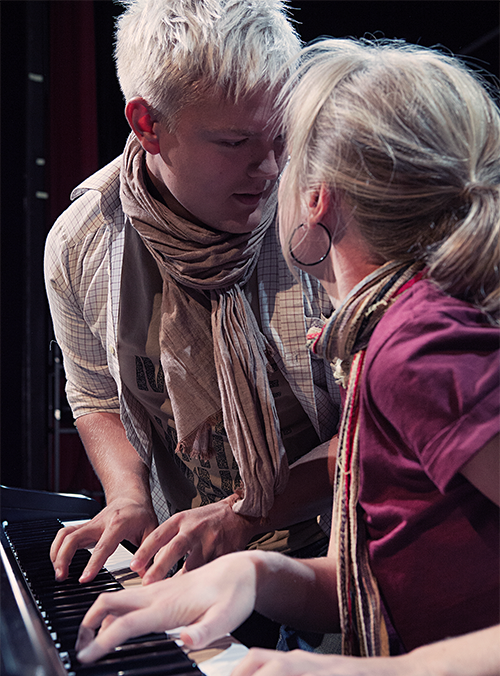 In 2009, Harjanne was asked to direct the musical The Wedding Singer, in Swedish. He said that no way, you’ve called the wrong person, I can’t speak Swedish – and agreed to do the project nevertheless. He’d use English. Around the same time, colleague Sören Lillkung told Harjanne to audition for Les Misérables again, this time in Åbo Svenska Teater. Harjanne was again skeptical, but agreed to try his luck. With two Swedish projects in sight, Harjanne started learning the language. He took lessons and told the fellow cast members to talk to him in Swedish. However, Harjanne’s language skills developed. After Les Mis, he was asked to do Next to Normal in Vaasa. The theatrical production company Polar Illusions, which Harjanne is the Head of Arts of, has also helped. The company put up a bilingual Finnish/Swedish production of Disney’s Aladdin last summer. 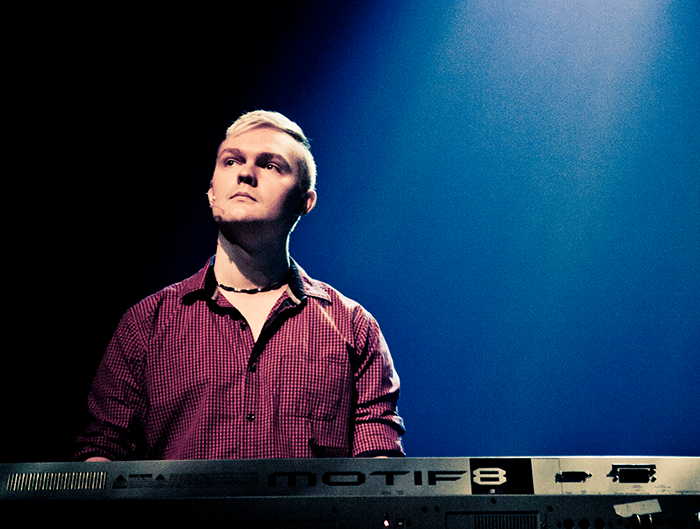 Spring Awakening, Helsingin kaupunginteatteri 2009. With Teemu Mustonen. When asked about his most embarrassing moment onstage… There isn’t one, really. Harjanne says he doesn’t get embarrassed easily. Harjanne has acted in one of the most famous musicals based on a book, Les Misérables. Next, he will be tackling an ensemble part in Jekyll & Hyde. Has he read the books the shows are based on? Harjanne thinks musicals and books are very different, so going by the original book isn’t a priority for him. How about favourite roles? Harjanne mentions dubbing the title character of The Adventures of Tintin. 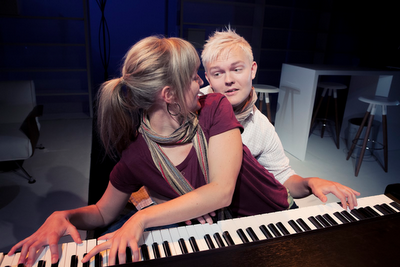 Next to Normal, Wasa Teater 2012. Again with Mikaela Tidermark. Harjanne has done so many dubs and musicals that one might imagine he never sleeps. He admits that he does lots of work. If he has free time, he spends it by playing badminton, watching movies – and going to the theatre. Traveling is also important to him. Next to Normal will close in December. After that, as mentioned, Harjanne will be seen onstage at Turun kaupunginteatteri's production of Jekyll & Hyde. 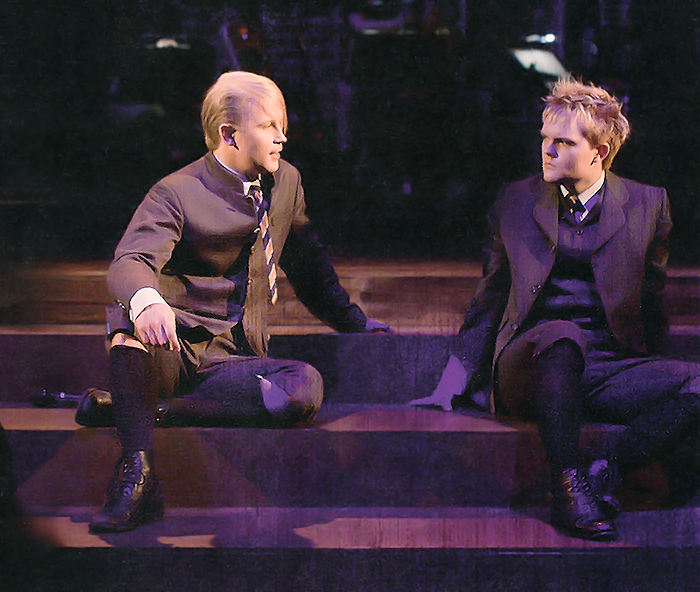 He’s a part of the show's ensemble and understudy for Riku Nieminen, who plays the titular part. Polar Illusions will stay an important part of Harjanne’s life. There are lots of plans. For example, they’re working on doing Aladdin in some other country than Finland. Harjanne wouldn’t say no to working in foreign countries in other projects, either. Jekyll & Hyde, then, will only employ Harjanne for a limited time. The production will go on for a longer time, but Harjanne leaves Turku after the spring’s last performance. He won’t yet reveal what he’s going to do after that. Photos by Ville Akseli Juurikkala and Frank A. Unger. I tried taking my own – and of course messed royally with the camera, ending up with only lots of blur. Boo. Related: my reviews about Striking 12, Aladdin, WT Next to Normal. I've also published a version of this interview in Finnish. Wow, that sounds like such a cool experience for you. And wow, he seems like a really driven guy. Very inspiring. And he's younger than I am. I'm going to go cry. And hahaha... the same thing happens to me when I read.